Spring Qatar is a chronic disease of the connective shell (conjunctiva) eyes. There is a spring Qatar in childhood, more often in boys during puberty usually passes. The cause of the disease is not clear. In developing the spring of Qatar may play the role of UV exposure, the factors allergies. Its name disease received in relation with the observed frequency of the development process - the exacerbation of its spring and summer, the remission autumn and winter. Clinically for spring Qatar is characterized by the formation of the conjunctiva of the upper eyelid cartilage large milk-pink growths, reminiscent of cobblestones. Around the cornea can also see a similar growth (Fig). The process usually bilateral. Subjectively marked photophobia and itching. The disease long, the favorable outcome. Treatment. 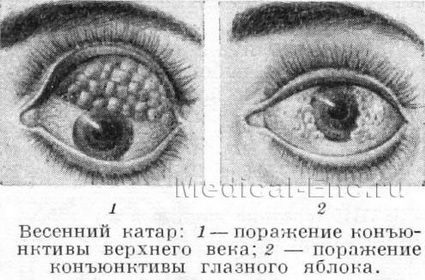 Instillation in the eye of 3 to 4 times a day for 3% solution of chloride calcium, 0.25% solution sulfate zinc with addition of 0.1% solution of epinephrine (5 -10 drops in 10 ml of a solution of zinc sulfate), 0.5% solution of hydrocortisone. Wear protective sunglasses.